54 – Ruby Roth Takes on Fox News! 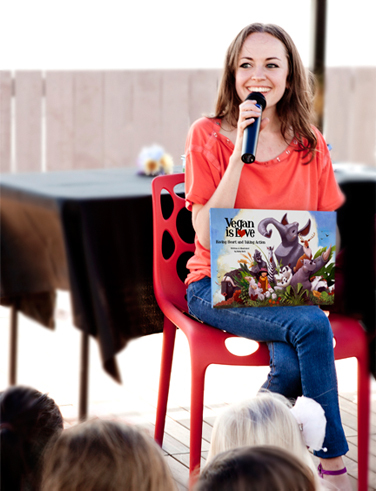 Author, teacher, artist, animal rights and vegan activist Ruby Roth, is our guest today! 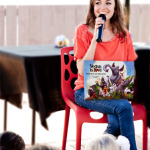 “Featured on CNN, FOX, Today, and other major media outlets, Ruby Roth is the world’s leading author and illustrator of vegan and vegetarian books for children. Vegan since 2003, Roth was teaching art at an elementary school when her students’ fascination with veganism inspired her to write That’s Why We Don’t Eat Animals in 2009—the first book of its kind in children’s literature. Vegan Is Love and V Is for Vegan followed. Today, Roth’s books have been translated into multiple languages including German, Italian, Korean, French, Polish, and Slovenian. HOW COME DOCTORS ARE NOT PRESCRIBING VEGANISM INSTEAD OF PILLS? Ruby responds to Dr. Dave: “The doctors are not studying healthy people and are focused on the sick.” “Veganism is a people’s movement, not from an institution.” It is great to discover how you can live a kinder life not eating or using animals or animals products. Vegans are the leaders in healthy food choices and options. If you are a vegan, lead by example to your circle of family and friends. Everyone has a choice, but many people are wholly unaware how awesome and fantastic and truly good for the planet and earth. BUT AREN’T GRASS FED AND ORGANIC MEATS AND DAIRY GOOD ENOUGH? “This is truly misleading. There are no purely organic all natural meat sources.” says Ruby. Many of these supposedly healthier options are any better or healthier, but are just packaged and priced higher in a whole or natural store. Listen to Dr. Dave and Ruby talk about this hot topic and controversy on today’s show. Ruby has gorgeously beautiful children’s books all about how some people don’t eat animals. So she educates and entertains most beautifully kids (and adults) of all ages all about loving animals and how we don’t need a life eating them. She was inspired to create her own books because she could only find talking vegetables or animals that seems to talk down to kidsor be relatable. So with her background in American Studies and Art, she decided to create these books herself and to address real issues like factory farms, the environment, and endangered species. These are amazing and beautiful books! BOOK RECOMMENDATION – DIET AND CANCER – IS THERE A CONNECTION? – Some breakthrough advancements in the understanding of cancer and it’s progression. – Cancers can take many years to grow, but there are ways to stop that growth long before it is ever detected. – The twenty-one most common types of cancer and the risk factors associated with each one. – How to protect your family from the horrors of cancer by changing your lifestyle. – Thirty-three of the most common risk factors for cancer and how they can actually be avoided. – How to stop cancer before it takes over your life by learning about some positive results from numerous research studies. – How to start “reprogramming” yourself and making changes in your lifestyle. Another fantastic book that Dr. Dave and Yoko love, especially now they are on an only plant-based food diet is Coco’s Healthy Cooking. “More and more research is available about the health benefits of a low-fat, plant-based diet making many people curious about it. However, it does seem like a daunting task to change your diet so drastically. In this book, I have tried to show that you can still enjoy your meals even if you no longer eat meat and dairy by choosing recipes that taste good, yet are made from “real” foods. I love cook books that show pictures of the finished recipe, so I thought that others would enjoy having those pictures as well.” says the author, Melinda Coker. “Thank you very much for listening! The show is literally downloaded by thousands and thousands each week now. In fact, we have passed the 150,000 downloads mark! Wow! I so appreciate you listening and sharing this show with your family and friends. I love to help people live a healthier life! It is so great that we have listeners from all over the world from the United States to the UK to Canada to Europe to Japan to Australia. I love hearing from people all over the world on Facebook, Twitter, Email, and our phone hotline too!” says Dr. Dave. 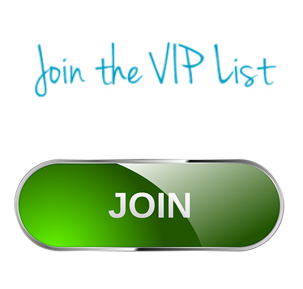 Check out the podcasts, special bonuses, recipes, blog posts, and more! See and hear Dr. Dave in action making smoothies and talking to you from his car with his tip of the week. —> Call Dr. Dave on the NEW Phone Voicemail Hotline: 410-429-7190. Leave us a question or comment. Please speak clearly because we may even use your question on one of our episodes of the show. Do you have a friend that needs to hear this show and live a better life and slice their age in half? Share this show with them and send them to http://www.sliceyourage.com. 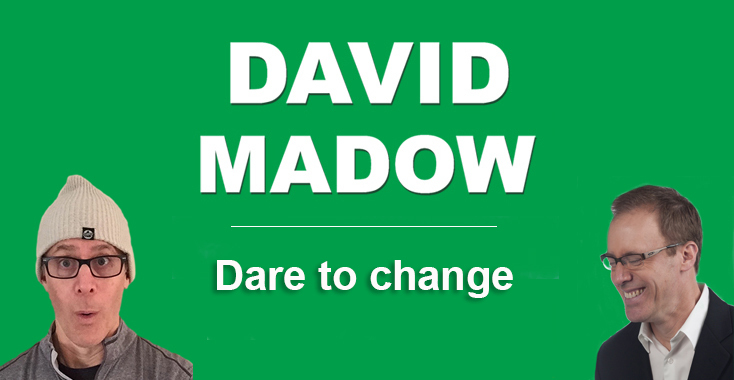 https://www.davidmadow.com/wp-content/uploads/2016/12/DMM-Show-itunes-3000x3000.jpg 3000 3000 David Madow https://www.davidmadow.com/wp-content/uploads/2017/07/Dare-to-Change.jpg David Madow2014-10-09 03:00:422015-06-09 18:33:1654 - Ruby Roth Takes on Fox News!